This memorial website was created in memory of our loved one, Arne Bue Jensen - Papa Bue, 81, born on May 30, 1930 and passed away on November 3, 2011. Where Arne Bue Jensen - Papa Bue is buried? 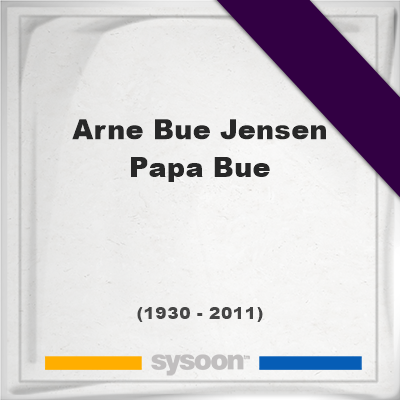 Locate the grave of Arne Bue Jensen - Papa Bue. How Arne Bue Jensen - Papa Bue died? How to find family and friends of Arne Bue Jensen - Papa Bue? What can I do for Arne Bue Jensen - Papa Bue? He was a Danish jazz trombonist and bandleader. Papa Bue was chiefly associated with Dixieland jazz. He led his own New Orleans Jazz Band and later the Papa Bue Viking Jazz Band - the only non-American ensemble to play at the New Orleans Jazz Festival in 1969. Papa Bue made dozens of recordings, including with early New Orleans jazz legend George Lewis. Note: Do you have a family photo of Arne Bue Jensen - Papa Bue? Consider uploading your photo of Arne Bue Jensen - Papa Bue so that your pictures are included in Arne Bue Jensen - Papa Bue's genealogy, family trees & family history records. Sysoon enables anyone to create a free online tribute for a much loved relative or friend who has passed away. Address and location of Arne Bue Jensen - Papa Bue which have been published. Click on the address to view a map. Arne Bue Jensen - Papa Bue was born in Copenhagen, Denmark. Arne Bue Jensen - Papa Bue died in Copenhagen, Denmark.